You’ve written your web copy. You’ve slaved over your words, editing each sentence and polishing each word. You think you’ve done a good job. Does your content sound like you? Finding our voice is perhaps the biggest challenge we face as writers. 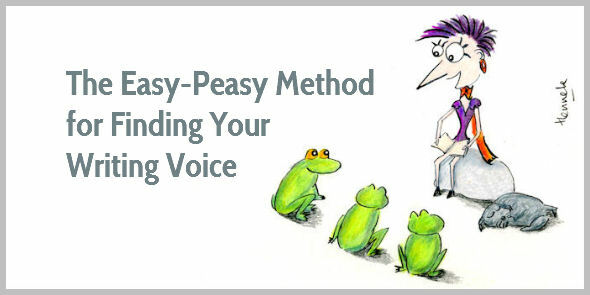 A strong voice helps us stand out in a snot-green ocean of boring content. A unique voice helps us bond with our readers, enticing them to come back to “hear” our voice again. An energetic voice makes us feel good about our writing. How can we find our writing voice? You may think, you’re born with a voice inside you. And you only have to discover it. Your writing voice develops over time. You can even steal it by studying the masters. And don’t listen to the people who tell you to write the way you speak. This is a really …. uhm … really big misunderstanding. Who told you that? When you speak, your sentences are often unfinished. You make grammar mistakes without anyone noticing. You use words and phrases and even whole sentences that are redundant. Content with a strong voice is carefully edited. It’s more concise than spoken language. It’s more sensory and emotional, too, because you need to compensate for lack of intonation and body language. You can’t whisper. You can’t cry. You can’t move your hands to stress your points. You can’t even make eye contact. When you write you only have words to communicate your message. Ready to have your mind blown? What if we told you bacon doesn’t have to just be a staple at breakfast and on your sandwich? Bacon can be a portable, dangerously habit forming companion at your fingertips, 24/7. You might start hoarding and stashing. Evernote addresses a wide audience. Their writing is to-the-point and simple. No frills. In contrast, Mancrates’ targets a more specific reader. They use more words to get their message across, but their voice has more emotion, and resonates stronger with their specific audience. Not thank-God-he-told-me honesty, where somebody points out you have spinach on your teeth. No, I’m talking about the sucker-punch-straight-to-the-face brand of honesty. It’s brutal. It’s ugly. It’s unexpected. Jon Morrow was one of my early mentors. His writing is in your face and almost-over-the-top emotional. He speaks strongly to his audience, and he probably repels a few people, too. I discovered Nancy Duarte’s writing only last year. With sensory words, she conjures up images in my mind, communicating her ideas strongly. I like it. What makes these 4 voices strong? We’ve all listened to speakers with a weak voice. They speak in generic terms. They use meaningless words. They don’t appeal to us with emotion. Their messages remain wishy-washy. Their ideas are buried under wordy sludge. Verbosity kills their voice. A strong voice starts with clarity of thought. You need to know exactly what you want to communicate, so you can present your ideas clearly. Without frills. Without distractions. Without blabbering. Look at the examples above again—they don’t use any redundant words. They present their thoughts clearly. What do you want your reader to remember from your content? And what action should he take? Can you explain this in one sentence? Cut away the fluff that doesn’t contribute to your message. Brush off the dirt. Chisel away the ugly parts, so your message pops and sparkles. We often think that writing is a one-way process. We sit at our desk. We type our thoughts. We edit. Good writing is a conversation with your reader. You sneak into his mind because you want to answer his questions, help him with his struggles, overcome his objections to buying from you. A strong voice speaks the reader’s language, uses the phrases the reader recognizes and understands. No jargon. No academic rigmarole. No complications. Being concise is often confused with using as few words as possible. Sometimes you need to use more words to make an emotional connection. To touch, tickle, and dazzle. Stating the bare facts doesn’t communicate your message. To connect with your readers, you need to make them feel your words. Paint a picture in your reader’s mind. Make your words more sensory and emotional. A monotone voice is flat and boring. It drones like a humming aircon. Without excitement. Without surprising the reader. Without stressing key points. To avoid boring the boots off your readers, you need to vary the rhythm of your writing. Mix long sentences with short sentences. Use one-sentence paragraphs to stress certain points. The staccato of short sentences makes your voice more dynamic. The key to developing a strong voice is to cut away the monotony, the boredom, the wordy sludge hiding your message. When you focus on concise and clear language, your voice will appear as by magic. Your content will shimmer and shine. And your readers will fall in love with you. I like how you demonstrate and compare voices. It really helps to understand the difference, and what really works and what doesn’t. Your course is truly the best writing course there is. I never met anyone coming close to adding so much value and over delivering that much. And your personal feedback is priceless. Thank you so much, Benny. This is a really helpful article, Henneke. Thanks very much! Oh help oh no it’s a… -green ocean (word omitted on the grounds of good taste). I was just escaping from the dreary winter weather by thinking of my favourite summertime walk. I stop at a duck pond and sit on a nice little bench to have a picnic and talk to the ducks. But then that word hit me (you know what it is!). Well it did paint a picture in your reader’s mind that was sensory and emotional. But my will shiny little duckpond ever shimmer and shine again? Of course, your duck pond will shimmer and shine again – even brighter than ever before. Wait till the sun shines on it! It’s difficult to please everyone. You may feel this word is bad taste, but someone else has highlighted the sentence with that word as an awesome line. Strong words make readers stop and pay attention, and remember. You may chase away a few readers when you over-do it, but you may draw other closer to you. And you can’t always get it right. First of all, Happy New Year! Glad to read your break was good. Thanks for writing another useful article. What I really like about your blog is that you break all the important parts of writing and turn them into conversations. While reading this article, I couldn’t help thinking about Twitter, which is microblogging. It’s a fact that very specific accounts with a very defined voice are the ones which get more engagement from people. And Twitter is one powerful tool in my opinion. Happy new year, and good luck with your thesis, Virginia! That’s a whole different game from writing a weekly blog post. How long do you expect it to take you? Yes, Twitter can be like microblogging. When I share links to articles, I like sharing specific quotes rather than use just the headline. Thanks Henneke. I love your voice. Thank you for offering such great examples. It’s great to have “visuals”. I like the examples you provided. You can clearly see the difference between each example. Jon is one of my favorite writers and in everything he writes, I can definitely hear his voice. I can feel his words. And that’s something that takes time, as a blogger, to get across. I get the same feeling from when I read your posts. The way you structure certain words, I can understand the emotion you’re trying to relay. I thought I’ve done a decent job in finding my voice this past year but I now see there’s more work to be done. There’s always room for improvement and I’m willing to make as much space possible to improve. Developing a voice is a never-ending task. My voice is different from a year ago, and next year it’ll be different again. We keep learning, and we find “new” words to use. Whenever I read anything, I also look for words that I like. Don’t worry too much about your voice. It’s more important to have fun, experiment a little, and keep writing! Hope you’re having a great week, too. Yes, totally agree – there’s a fine balance between being concise and adding personality. It’s about the feeling the reader gets from reading our content. If he gets bored, we’ve done something wrong! We’re either too wordy or we’ve stripped our content too bare. I did not, repeat, did not have a single clue as to what “snot green ocean” meant. It produced some images for me (none that I want to amplify on here), so I went and googled it. I found a reference to “snotgreen sea” from James Joyce in “Ulysses”? Was that your reference point as well, Henneke? That aside, another stellar article! One takeaway for me: I’ve commented on your illustrations before, but in the context of this post, I would submit they contribute quite nicely to your voice! Well, to be honest, I was just looking for an alternative to “drab” or “sludge”. And then I remembered someone talking about snot-green. I don’t even know who mentioned the word or where. But it felt like a good alternative. Perhaps a little too strong for some? I didn’t know it was from James Joyce. Thank you for enlightening me! Thanks for the mental tune up for the new year. I like the contrast between Nancy Durate and Jon Morrow. You showed us a velvet glove vs. a sledgehammer. Both work in the right context. Love the way you explain the difference – a velvet glove vs a sledgehammer. And yep, they can both work. Thank you for stopping by again, Dave. I always forget about you! I love reading your posts and learn so much from them. I signed up to your snackable tips and loved each one! I want to learn from you and hope to get into your course. I’m new to blogging and freelance writing so I’m developing me voice. I hope I’m not too wordy or stale when I write my blog posts. I hope I come across as personable but I have no idea. You always forget about me? I had a quick peek, and your writing isn’t wordy or stale. Don’t worry! This is my first visit to your site. I love to write and took a writing course many years ago. Life and personal problems took away that dream. So after I retired from the business world and the children were gone and I was alone, I studied painting. I found a local artist close to my home and studied there ten years or so. I think my paintings are good and I sold quite a few in the past. But nothing has happened for a few years even though I have a website. There are a few who read the blogs; none who read newsletters when I put forth the effort. Blogs – newsletters — what’s the difference. Of course, age has made a difference in everything even though I am considered “remarkable for my age” by family and friends. I look forward to hearing some comments. It’s difficult to comment without any background knowledge. Your paintings look lovely. How are you promoting your blog? So much competition exists these days, that it’s rarely sufficient to simply post on a blog. Consider joining an artist’s group on Facebook. Quite a few artists grow a following on Instagram (or even Google Plus), too. You don’t have to do all of the social media channels, but it helps to build a following. You could also try sharing more about your process and your sources of inspiration (Austin Kleon does this effectively. You might also want to check out Hugh Macleod’s blog (he wrote a post why most artist’s blogs fail: http://gapingvoid.com/2010/06/14/wmabf/). Most people don’t stop by a blog just to see art. They like to learn more about the artists – what drives them, how do they work, what inspires them, how do they look at the world around them. I/m not sure how well I have practiced the secret. But, I have been aware of it lo these many years. P.S. Should you see Henrietta, please tell her I asked about her. And, let her know the children are waiting for her book. Ahh, Curtis, you’re so eloquent! I had to look up the reference – I had never heard of kissing the Blarney Stone before. A major omission in my Dutch schooling! Perhaps I need to go to Ireland to kiss this famous stone? I love the drawing. I feel as though I could be in it listening to your message. This post is wonderfully written and useful to beginners and veteran writer’s alike. I especially like that you pointed out that one’s writing voice develops over time. I’m hopeful that is true for my “young ” writing voice. Thank you! Don’t worry too much about your voice. When you focus on the basics of good writing, then it’ll appear. Here’s something I learned about voice from reading to my two young daughters. They’re four and five, and their favourite stories, the ones I’m asked to read time after time, all share one quality: you don’t just read them, you perform them. The pace and the rhythm sweep you along. The simple, emotive words build the drama and tension. The story comes to life. I think the same is true of good grown-up writing. You perform it to yourself, of course, but a strong, clear voice stirs you in a similar way. And that makes it much more memorable. Great to see you back – hope you have a fantastic year. I love the point you make – good stories aren’t read, they’re performed. You remind me that when I read the book “Resonate” by Nancy Duarte, I was struck by how many similarities exist between blogging and presenting. It’s all about drama, tension, emotion, and performance. Thank you for adding your thoughts! Hope you’ll have a fantastic year, too. You’re so cool. I love reading your posts because your voice, like the ones you use as examples here, is so clear and lovely that I feel like you’re the kind of person I could talk with for hours. It’s no wonder you’re such a successful blogger! It’s good to be back here. Happy New Year! Very informative. After my third novel, I look back and see that my writing (crime thrillers) really reflect the character who’s speaking. I attribute this to the ‘actor’ inside me. God knows he/she wants out! Interesting idea. If you’re a good actor, you can write in many different voices. I was confused about how to find my voice and have it come through clearly in my writing.after reading your article ,I now feel ahuge sence of relief because you understand this problem and was able to precisely explain and enable me to get that stumbling block. I am free and full of joy and relief, I will get back on this journey of writing a great book that will help,plus entertain my readers,Keep up the great work, thank you so much. Knowing my writing voice has been a challenge, but with your ultimate guide, I’m sure I can identify my writing voice. Thank you for sharing the insights.